We've had the pleasure of reviewing some products from Tru Kid before and had a great expereince. So when we were asked to review one of their newest products, Hero Stick, we definitely wanted to review and see how it worked. The Hero Stick is easy to use and is very handy for your every day boo-boo's and ouchies your little ones may get. 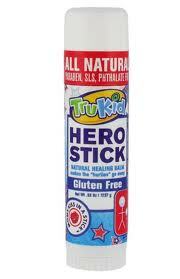 The Hero Stick also helps with bug bites, eczema and rashes as well. What I love about Tru Kid and their products is that all of them are all natural and organic. With a son that climbs, jumps and runs every where, this stick worked great for me and was very convenient. Small enough to fit in your purse to take with you on the go and strong enough to make every ouchy feel better. I was really impressed with how well the Hero Stick worked. Not only was this a life saver at birthday parties and family functions, but this seem to do the trick especially on Halloween when my son ran and fell. He had a scratched knee and this seemed to not only calm him down, but took away the sting of the boo-boo he got. This is definitely a stick that will benefit every mom out there with their little ones and definitely something I hope to see out in stores here in Canada soon. Tru Kid has provided us with a coupon code for you readers to receive a free bubbly body wash once you spend $30 or more. Disclosure: All opinions are my own. I received a Hero Stick at no cost for the purpose of this review. No other compensation was received.